A case from practice shows, what problems could occur, when a family moves into a not yet sufficiently dry house. The property was given free by the developer after a construction period of six months. Floor coverings were laid and baseboards attached. Furniture and moving box stood in the rooms. A few weeks after moving in, the residents discovered black spots on the walls and partially moldy furniture. The following measures have been taken then: Heat during the summer period, putting up dehumidifiers and an above-average regular window ventilation. Each person can imagine that a normal family life must be disturbed by the subsequent drying. 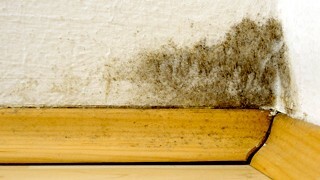 An ongoing fear of a further mold colonization is associated with the health risks due to a pre-damage of one family member. Building-biologists therefore advice families to perform humidity measurements in different rooms by data logger before moving. Only if the values are acceptable, the furniture can come. The work contract with the developer should regulate this situation clearly. With inclusion of a building surveyor for acceptance is important to ensure that moisture meters are used for the examination, in particular in the basement or in contact with the soil. A visual inspection is not sufficient for the construction approval . This entry was posted in mold and tagged Building-biologist, construction, humidity measurement, mold colonization on 2012/09/27 by joachim-w.